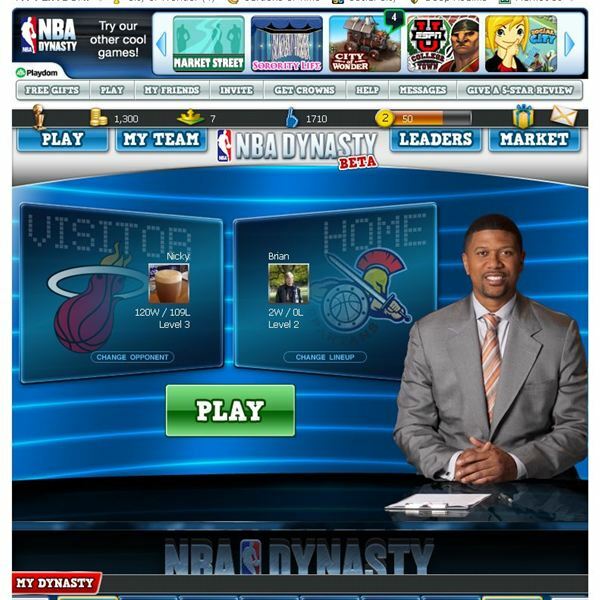 Playdom has released NBA Dynasty on Facebook. The social networking site has seen an increase in NBA games recently and this is the latest offering. In NBA Dynasty, you control a team made up of NBA stars. You can play as a real NBA team or one that is made up such as the “Spartans,” for example. You have the ability to change your lineup with player card packs you can buy in the game store. You have playbook which consists of various boosts you can buy to improve your team such as better defense, for example. 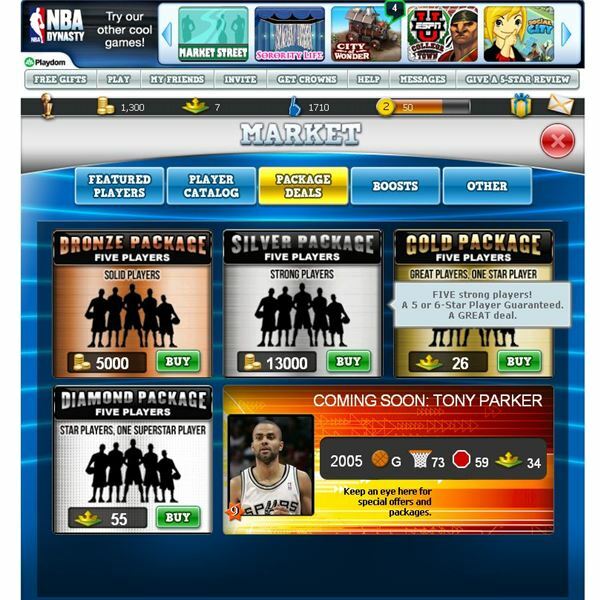 The game features current NBA stars as well as your favorites from the past in the game store. You can sort and find an opponent closer to your current level for some fairness in the game play. In NBA Dynasty the game simulates the first four quarters and then gives you control for the fourth quarter. You can also just simulate the whole game if you like. During game play, you can substitute your player cards. Some players may get hot or cold so you might want to bring one out for another one of your better player cards. At the end of the game, you’ll see which of your players were at the top of their game and the point spread during each quarter. While it’s nice to take control during the fourth quarter most of the game is simulated so the overall game play isn’t that much fun. It would be nice to play through a whole game and then see the outcome. Despite this, the games can be fun to play and if you pick an opponent close to your level they games will be close and exciting. The game even has a great box score feature so you can see which players scored during the game, which is a great feature. NBA Dynasty has a nice feature where not only can you buy individual players from past seasons but you can also buy them from different years. For example, if you like Clyde Drexler you can purchase the player from 1984 or 1983 as well as any other year he played in the league. Click the player, get the statsisitcs from that year, and if you have enough gold or game cash, add the player to your lineup. You can also buy players packs with bronze being average players and diamond being top of the line players. The game also features special offer players but these are quite expensive. During games, you get a nice soundtrack and there are other court sounds as you play the game but overall the game sounds are quite disappointing. Cards on the court depict players and you get text from shots and rebounds for example but the game could use some actual player animations. The player cards do look nice with color photographs of each NBA player and they are large enough. Overall, the game looks great but it could use some animations during game play or the ability to control players to a certain degree. 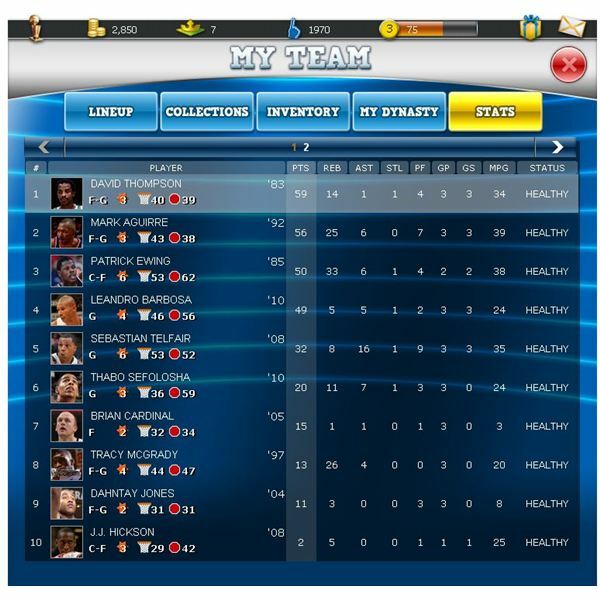 NBA Dynasty has a nice easy to follow interface that makes the game fun to play. There are no complicated menus to follow in this game. Click the play button to take part in a game, click the “my team” button to manage your team; view a leader board, and checkout the game store from the top of the game screen. Each tab has its own sections you can view from the drop-down list. For example under my team, you can view your game news, collections, see your boost playbook, current lineup, and view information about your dynasty. The game also loads quickly unlike other Facebook sports games. The game features average multiplayer options. You can play your Facebook friends or random Facebook users. You can sort to find someone near your level so games don’t end up in a blowout unless the other player has managed to field a great team. Leagues will be coming to the game soon so this might make the multiplayer options a bit better. You can visit the courts of your Facebook friends and send them gifts, which is standard for many Facebook games. NBA Dynasty is a basketball worth playing and it has some nice features. Adding leagues to the game should improve the game play. 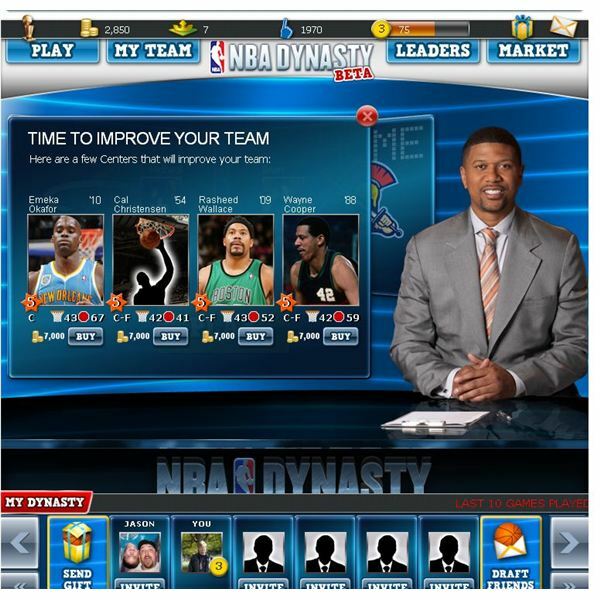 It can be fun to make up a team of your favorite NBA stars and try to beat your friends. The best part of the game is tat it is easy to play even if you’re not that much of a basketball fan or know much about the game. All images from NBA Dynasty. Source: Article is author's own experiences playing NBA Dynasty on Facebook.